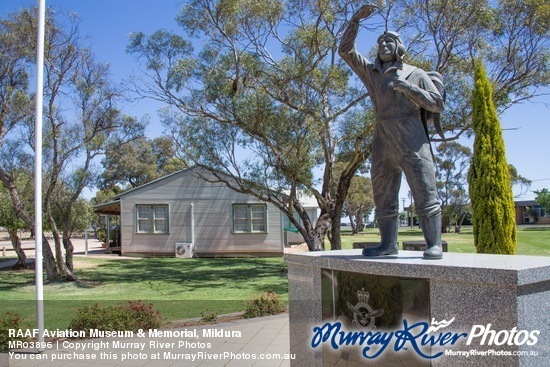 During World War II many men left the Murray Valley region to join the armed forces. Much of their previous work was taken over by women. The region became an important resource for food production and processing during the war effort. Training and prison camps were established at various locations in the valley such as Loveday in South Australia. Following World War II, the Coomealla Irrigation Area in the Sunraysia region of New South Wales was extended for solider settlement. With water being secured to irrigate and create Australia’s Food Bowl, both the State and Federal governments introduced policies and incentives to populate the river regions and extend the irrigation areas. Other initiatives such as the Snowy Scheme and regional development also followed and had a significant impact on the Murray Valley and Australia’s place as successful multi-cultural country. 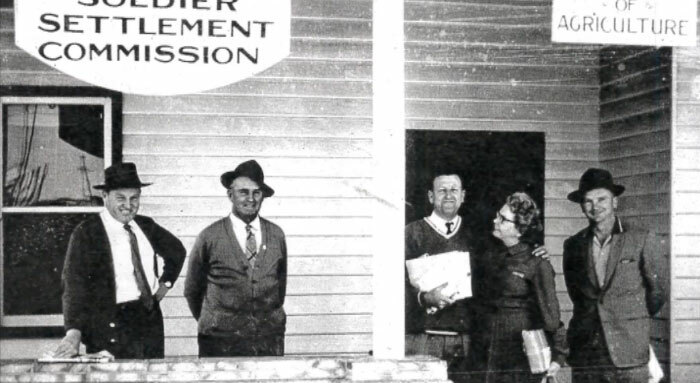 The post-WWI and WWII soldier settlement policies were introduced as incentives to settlers. The States provided blocks of land and the Commonwealth government sponsored the loans. Blood, sweat and tears was the order of the day for many of these new settlers to the river regions. Most had little or limited farming expertise; they lacked equipment and were unfamiliar with rural life. Most early settlers had to live in huts, battle rabbits eating their crops and irrigate their trees by hand, as the government had failed to deliver on promised irrigation works. 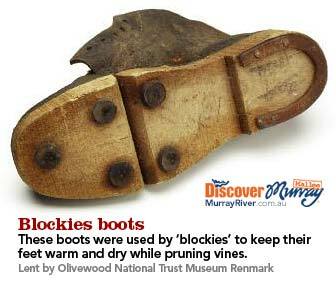 These settlers or ‘blockies’ as they came to be known, carved out a new life with ingenuity and adapted to the harsh reality of farming in the river regions. 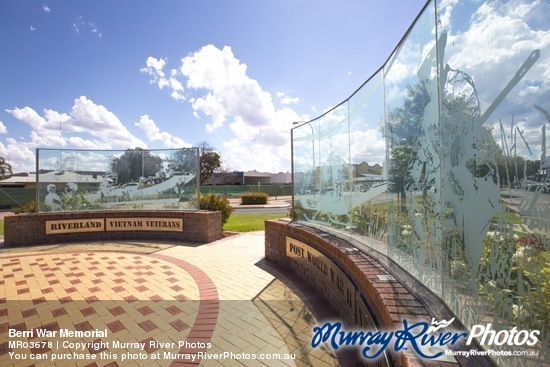 The Murray River region across New South Wales, Victoria and South Australia contains a vast range of War Memorials to honour the fallen and those that sacrificed themselves for Australia as well as highlight various wartime activities. 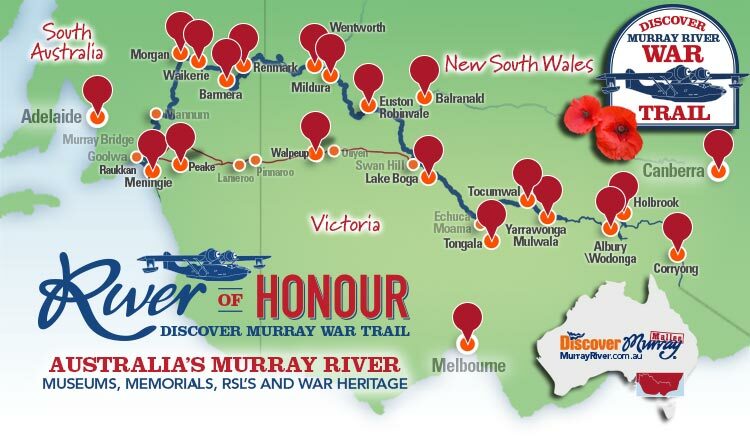 This Discover Murray River War Trail aims to assist and educate those travelling our great river region to connect with the stories of the those communities who acknowledge their fallen and showcase some of the wonderful experiences, museums and monuments you can experience that preserve and protect the legacy of our diggers for the future. On the way to Albury Wodonga stop in and experience Holbrook's unique link with submarine's that began during World War I. The town was renamed from Germanton to Holbrook after Lt Norman Holbrook, who was awarded a Victoria Cross for a daring underwater raid on 13 December, 1914. Lt Holbrook had taken the British Submarine B11 into the Dardanelles to torpedo and sink the Turkish battleship "Mesudiye". Commander Holbrook made a number of visits to Holbrook before his death in 1976. In 1982 his widow, Mrs Gundula Holbrook donated his medals to Holbrook, these medals are now officially loaned to the Australian War Memorial, where they are on display. 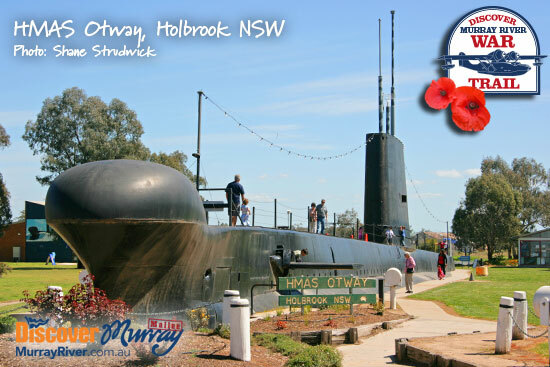 Today, Holbrook's vision of a fitting memorial to Australian submariners has become a reality with the above water line superstructure of HMAS Otway about 90m from bow to stern lying in the centre of Holbrook. Next to it is a 1/5 scale model of a World War I B11 Submarine, a life size Mark V111 Torpedo and a statue commemorating Commander Norman D Holbrook. A Submarine Museum now displays photographs, Commander Holbrook's memorabilia, an amazing new 4D hologram, submarine components and mock area of the submarine interior such as wardroom and control room with a working periscope. 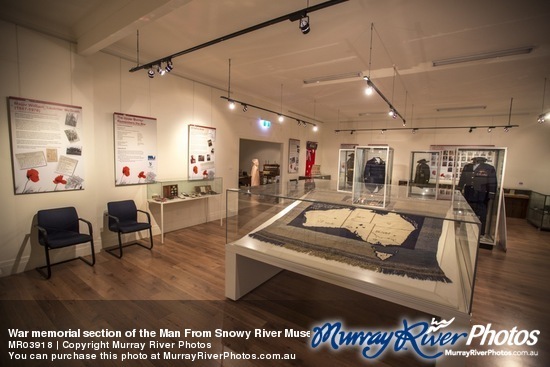 This wonderful museum contains artifacts from the region's pioneering day as well as some memorabilia from Jack Riley - The Man from Snowy River. Also contained in the museum is a wonderful section and interpretive signage for those that served for Australia in war. It includes the story regarding the knitting of a rug mainly of used wool, in a prison of war camp in Germany by Jim Simpson during the Second World War (1939-45). This displayed rug was knitted in Stalag IVB Mühlberg on Elbe, Saxony, Germany. The Snowy Mountain Scheme had a major impact on post-war irrigation, power, regional development and multi-culturalism in Australia. 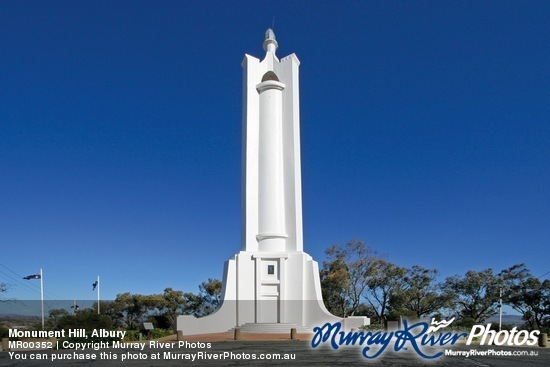 Excellent views of Albury-Wodonga can be seen from the hill where the War Memorial is located. The monument was designed by architect Louis Harrison in 1923 and erected in 1924 at a cost of 3,000 pounds. In 1925 on Anzac Day the Memorial was dedicated to the men and women who served in World War I (1914-18). 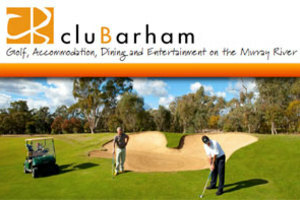 Inside the Commercial Club is a story and the flag of Albury’s Own battalion as well as its flag. Noreuil Park has been a favourite site for the Albury community to swim in the Murray River over summer but few people know that it was named after a famous battle on the Western Front in WW1. 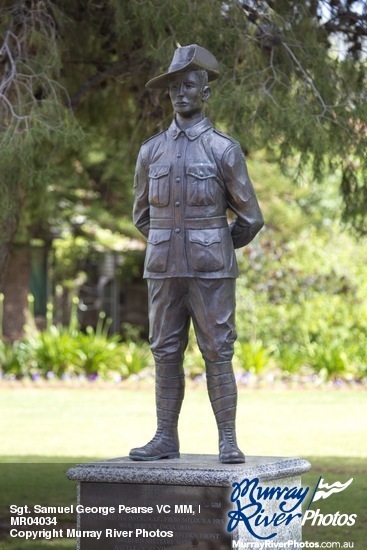 The life sized bronze statue of Captain Albert Borella VC, MM, MID and bronze blade inscribed with the 100 names of the Australian recipients of the Victoria Cross are located at the Peards Complex, 119 Borella Road, Albury. Albert Borella was awarded the Victoria Cross for "most conspicuous bravery in attack" at Villers-Bretonneaux (sister town to Robinvale), France in 1918. He died on the 7th February 1968 and was buried with full military honors in the Albury Cemetery. A memorial display honoring Captain Borella is also located inside Cafe Borellas, adjacent to the statue. Currently close to public due to security reasons. The Bandiana Army Museum, just east of Wodonga on the Murray Valley Highway, is one of the largest and most diversified army museums in Australia. 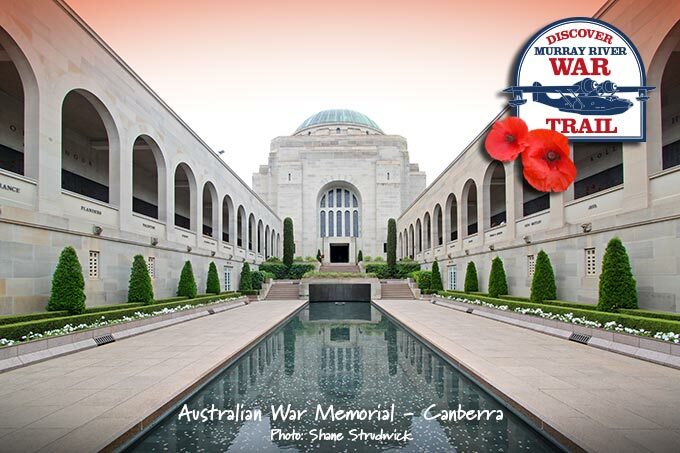 The museum enjoys a close working relationship with the Australian War Memorial in Canberra. The collection covers the Australian Army's involvement from 1863 through to the present day. There is an extensive range of male and female uniforms on display. There are guns, tanks, vehicles, motor cycles, medals and much more to see and do. The vehicle collection is also extensive and includes many armoured vehicles which can be seen up close and personal. On display also are anti-arcraft and field guns. Video footage of these pieces can be seen in the theatrette. As you travel to the museum, you will also be travelling along the Vietnam Memorial Avenue of trees. Between 1947 and 1971, more than 300,000 migrants from over 50 countries called Bonegilla their first Australian home. Some stayed only a few days, and others for months. Some relished the experience, and others questioned their decision to come to Australia. These memories have been commemorated with the heritage listing of Bonegilla’s Block 19, its Tribute Wall and visitor centre. 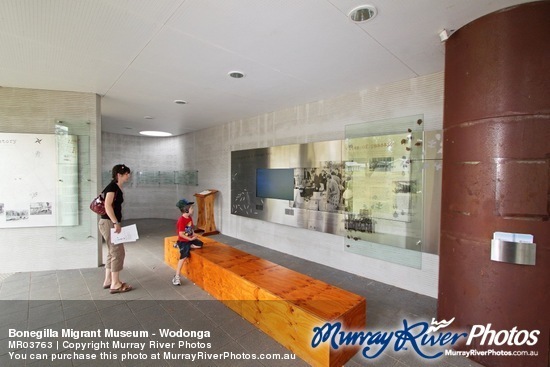 September 2010 saw the re-launch of the site after extensive works completed by the City of Wodonga, Parklands Albury Wodonga and Albury City to preserve, promote and support the Bonegilla Migrant Experience. 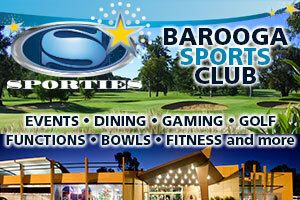 It is a place that for many has an important role in their beginning in Australia. For others, it is a place that has contributed greatly to the culturally diverse Australia we see today. Visitors welcome! More information. 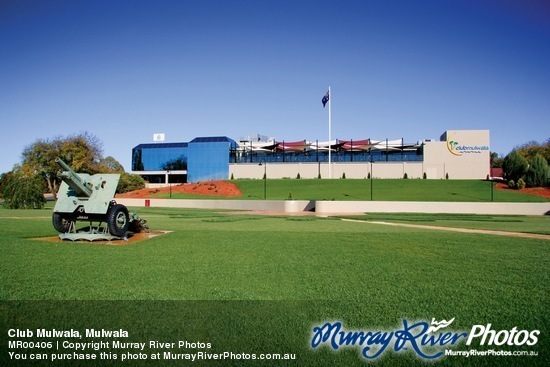 Yarrawonga-Mulwala was where the Murray Valley League (now the Murray Darling Association) was founded in August 1944. This organisation was a direct result of war time planning for future regional development. McIntyre Field was established by the USAAF in January 1942 (in expectation of the Japanese invasion of Northern Australia) and handed over to the RAAF in November 1942. It was the largest aerodrome in the Southern Hemisphere at one stage. 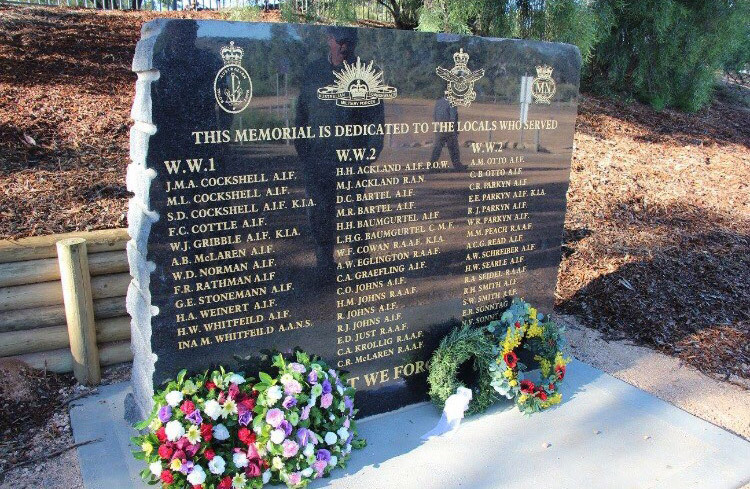 The base was named after Captain Patrick W. McIntyre who was killed in a plane crash in Queensland on 5th June 1942. The old gate and guardhouse from the original main brick entrance to the Airfield was moved after the RAAF left and can now be found at the rear entrance of the Tocumwal Golf Club in Golf Links Drive (continuation of Emily Street). At its height there were over 450 buildings including workshops, living quarters and storage sheds. Most of the buildings were made in the US and transported to the airfield. Several of the old hangers can still be seen. Some of the runways have become roads servicing several farms. 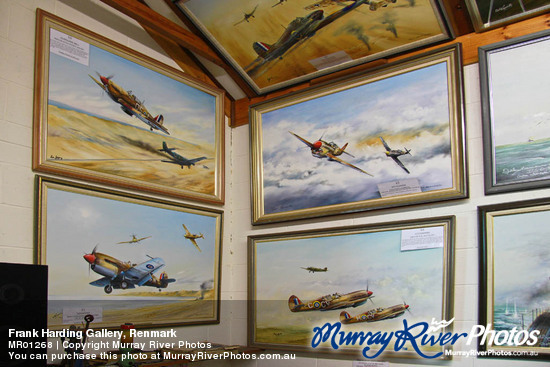 A museum display of photographs, articles, books, model aircraft and memorabilia are on display at the Tocumwal Visitor Information Centre. A one hour presentation for groups can be arranged by appointment, telling the incredible story of the war years at Tocumwal Aerodrome. 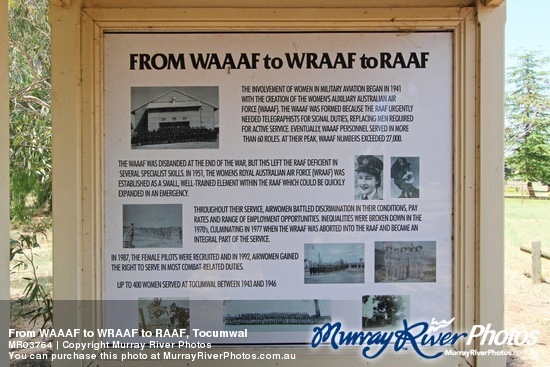 Extending the airforce history you can take the WAAAF Creek Walk, a 1.6 kilometre walk just out of town on the Barooga Road. The involvement of women in military aviation began in 1941 with the creation of the Women's Auxiliary Australian Air Force (WAAAF). The WAAAF was formed because the RAAF urgently needed telegraphists for signal duties, replacing men required for active service. Eventually WAAAF personnel served in more than 60 roles. At their peak, WAAAF numbers exceeded 27,000. Up to 400 women served at Tocumwal between 1943 and 1946. The 3rd Cavalry Regiment had a squadron serving in South Vietnam for nearly six years. Between 1967 and 1972 the men from the Regiment served alongside and supported our Australian infantry in every major operation conducted by the 1st Australian Task Force (1ATF). These operations included a pivotal role in the battle of Long Tan in 1966, in 1968 the Tet Offensive and battles for the Coral and Balmoral Fire Support Bases in 1968; and the battle of Binh Ba in 1969. Using Armoured Personal Carriers (APCs), the Regiment’s squadron was a highly mobile force that served throughout Phuoc Tuy province. 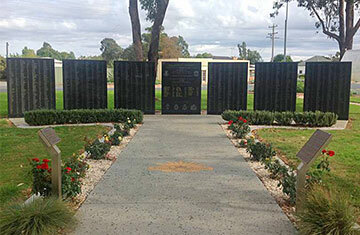 The Memorial is approximately 5.5 km off the Murray Valley Highway about 20 minutes east of Echuca. The memorial consists of seven, 2 metre-high pillars of black granite with the names of 1200 veterans engraved in silver. The central pillar includes the names of the various cavalry units who served together with a roll of honour engraved in gold for the 20 personnel killed on active service. Tongala was chosen as the preferred location for the monument because the town already hosts the Memorial to the Light Horse and The Avenue of Honour. The site provides unrestricted access. 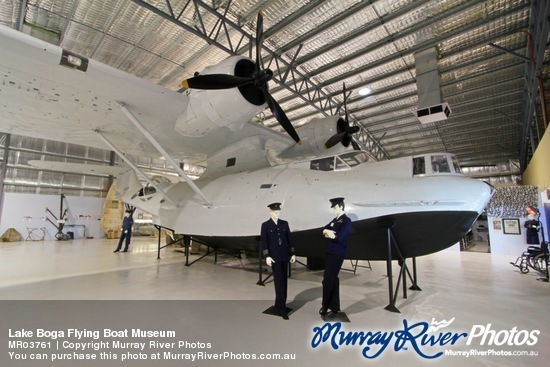 Lake Boga is home to the Flying Boat Museum, home of the historic Catalina Flying Boat and site of the secret RAAF Repair Depot. Lake Boga was an integral part of allied defense during World War II, with a facility that helped to keep Australia safe – the No.1 Flying Boat Repair and Service Depot. On the original site of the the No.1 Flying Boat Repair Depot, stands an underground Communications Bunker which has been transformed into the Flying Boat Museum. It is fully air conditioned and is an educational trip into our recent history. Also at the museum is an interactive map of the Pacific region and an informative 20 minute film in the theatrette. Villers-Bretonneux, France became a sister city to Robinvale in 1984-85 although the first contact visits were made in late 1970's including a youth exchange. The two towns are of similar size and both rely on horticulture as their principal economic activity. Robinvale is a World War II soldier settlement community. This relationship with Villers-Bretonneaux was inspired by the death of Lieutenant George Robin Cuttle MC, resident of Robinvale, killed near Villers-Bretonneux in 1918 during the First World War. Lieutenant Cuttle was reported missing in May 1918. After a lengthy search, his family finally found the wreckage of his plane in a field in Caix, in 1923. 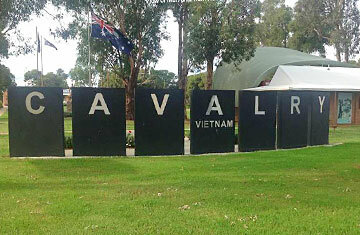 In memory of their airman son, Lt. Cuttle’s family renamed their new settlement on the Murray – Robinvale (vale Robin). The town centre pays further tribute, named Caix Square. The Rural Life Museum has a wonderful collection of memorabilia from the early days of settlement in the region. Display items date from the 1860s and includes a wonderful display of photographs of all the original World War II Soldier Settlers who were granted land on which to grow grapes, dried fruit and citrus in the Robinvale Solder Settlement Scheme of 1947. Other items include Post WWI Laundry Mangles and other war memorabilia. Contact the museum on (03) 5026 4045 or visit the musuem for more information. In 1945 the Australian Government enacted the War Service Land Settlement Scheme. Seven and a half million acres of rural land was put aside for former soldiers to settle on. Robinvale was chosen for its fertile soil and suitability for irrigation. Imagine returning from World War II to a tent on a sandy hill. With archival images that have never before been digitised, some of Robinvale's last original soldier settlers tell their story. The theme of the Balranald and District Military Heritage Trail is Courage, Initiative, Resilience and Compassion. 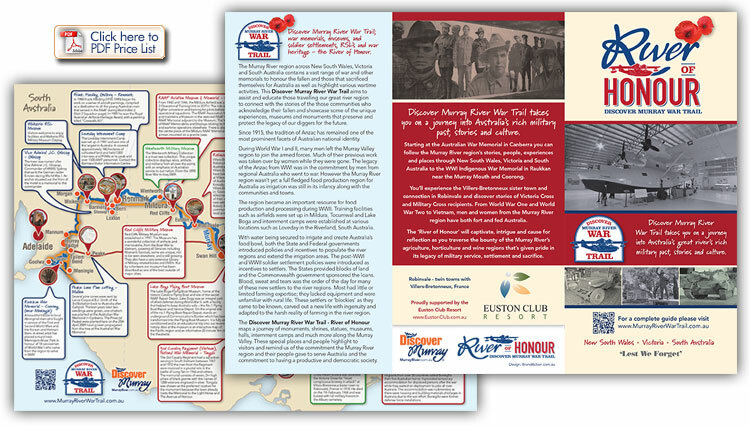 It consists of stories of the experiences of individuals from the district during periods of conflict and how those who returned contributed to the community. Stories include those of a WWI nurse, a chaplain who rode with the 4th Light Horse, a WWI Italian soldier in the Alps, and survivors of the charge at the Nek and legendary night-raid to liberate Villers-Bretonneux. There are also stories of WWII pilots, POWs, service women, intelligence officers, and a member of the Volunteer Defence Corps. The walk extends over one kilometre, from the We Street – Market Street corner, approximately 50 metres west of the Balranald District Ex-Servicemen’s Memorial Club, along Market Street/ Sturt Highway, right into River Street and along the bank of the Murrumbidgee River (Court Street) to the War Memorial Park. The individual story-signs are spaced around30 metres apart in order to focus on each individual’s story and to provide enough ‘space’ between stories to provoke thought, reflection or discussion. The completed trail will have around 40 story-signs. 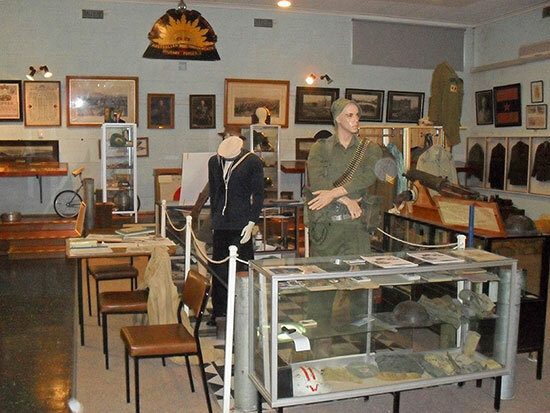 Situated in Red Cliffs/Irymple RSL Clubrooms in Jamieson Ave, the Red Cliffs Military Museum was established in 1997, when the committee decided that there were so many items being handed in for safe keeping, they would use the unused billiard room to house these items. It was also decided to open to the display to the public. The Museum has a wonderful collection of artifacts and memorabilia, from the Boer War to Vietnam, covering all Services including Women's Services, some are unique, not to be seen elsewhere, and is still growing. There is also a very extensive Library of Military related books and DVD's. Run by volunteers our museum has been described as one of the best outside of major cities. 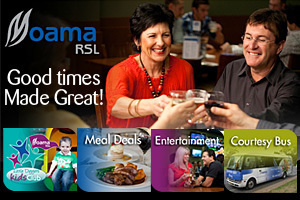 Schools, service clubs and visiting coach tours are regular visitors, and there have been visitors from all over Australia and many parts of the world. 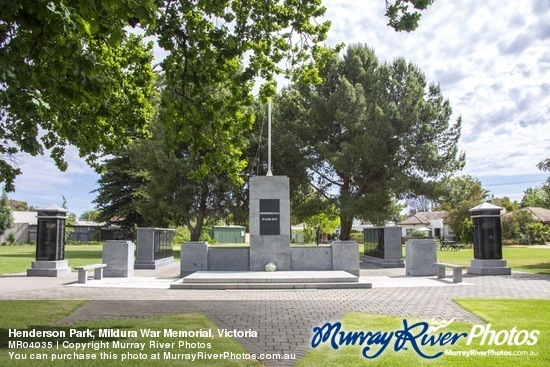 In a large beautiful park on Deakin Avenue you'll find the Mildura War Memorial. This memorial is a testimate to those who served in WWI and WWII. Henderson Park, Corner Deakin Avenue & Thirteenth Avenue. The park features a statue of Sgt. Samuel George Pearse VC MM. His war service incluced Egypt, Gallipoli and the Western Front. He was awarded the Military Medal at the Battle of Menin Road in 1917 and the Victoria Cross posthumously. Samuel George was killed in action at Emtsa, North Russia 29th August 1919. From 1942 until 1946, the Mildura Airfield was a RAAF Base, being the home of No 2 Operational Training Unit or 2OTU. The role of 2OTU was to provide operational fighter conversion and training for pilots before they were posted to their operational squadrons. 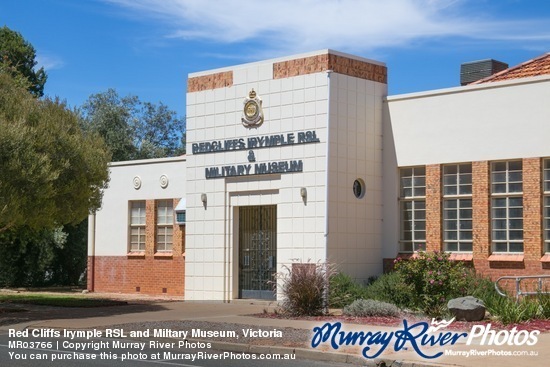 To preserve this important part of Mildura's heritage, the RAAF Association Mildura Branch has established and maintains a Museum in the restored RAAF Headquarters Building. There is also a RAAF Memorial adjacent to the Museum. 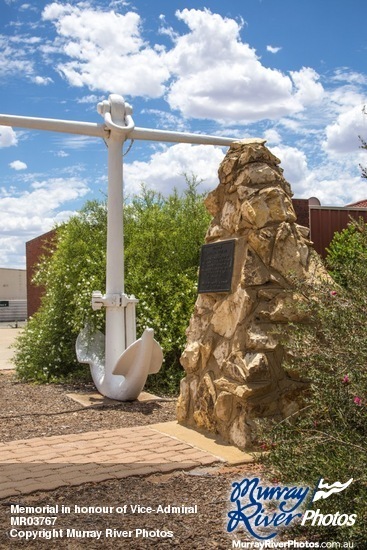 The Museum contains a large number of RAAF memorabilia and displays relating to the activities of 2OTU at Mildura and wartime operations elsewhere. In particular, emphasis is placed on preserving details of those who served. Visitors are welcome to leisurely browse the displays in four display rooms and the corridors or be guided by our friendly volunteer staff. There is also a Memorial on the ground; the centrepiece is a life-size bronze sculpture of an airman mounted on a granite base. Hours: The Museum opens on Tuesdays, Fridays and Sundays from 10.00 AM to 4.00 PM or by special arrangement by ringing the curator on (03) 5022 7691 during open times. 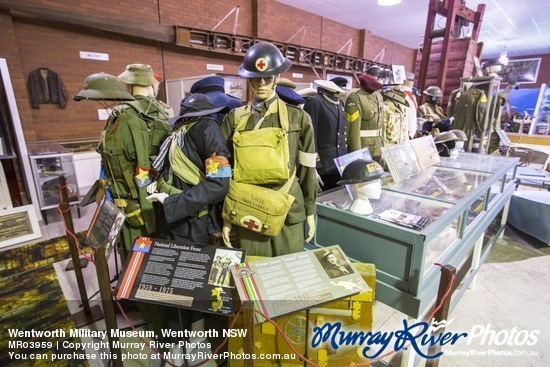 Located at the Historic Port of Wentworth, the Wentworth Military Collection is a must see for the avid military history buff, servicemen and women past and present or anyone who has a connection to the Australian armed forces. 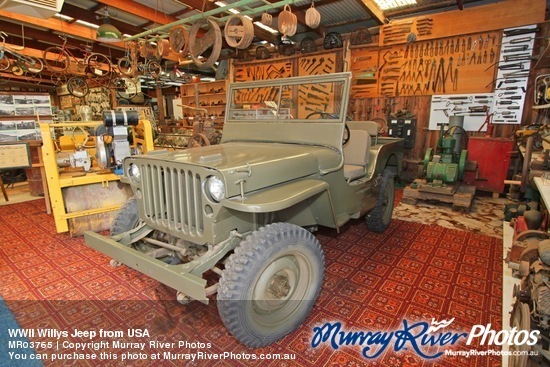 This unique collection displays relics, artefacts and militaria from all over the world, with an emphasis on Australian service to the nation. From the 1890 Boer War to Iraq 2009, the collection also displays past and current service issue uniforms and equipment of today. Launched as a public collection on Remembrance Day 2011, the Wentworth Military Collection now displays a vast range of items for reflection and contemplation. With the aim of creating a context for discussion and the sharing of related stories and service histories, it is an essential visit for all generations. During the Second World War, Wentworth and the surrounding Shire hosted a number or practice bombing ranges for use by the RAAF's No.2 Operational Training Base, base at the Mildura Airport. These sites include the Perry Sandhills, The Mock Battleship, Lake Victoria, Lake Gol Gol and White Cliffs State Forest. Fifty two pilots and ground crew were killed during the period of training in the region. Crash sites are marked by memorial plaque stones at each of the respective sites. Local items of interest on display in this collection include ordnance from the Wentworth Range, Kitty Hawk wreckage from a number of crash sites around Wentworth and donated items from local returned servicemen and their families. For more information visit: www.wentworthmilitarycollection.com or visit the Wentworth Rotary Museum where the collection is housed. A rare artifact from World War I is the Walpeup 'Welcome Home' banner for soldiers of the area. They arrived by train to a wonderful reception by the community. There are photos of those that served from all the region in the back room. This small town in Victoria’s Mallee (west of Ouyen) has a wonderful culture and story. Japanese internees worked from this camp to cut wood for the pumping stations and river steamers. 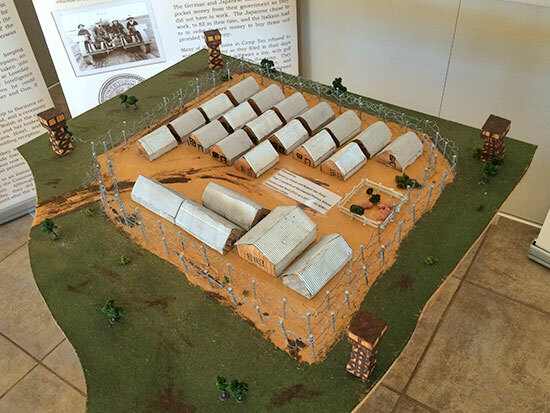 The camp consisted of wood and iron buildings for kitchens and mess areas, and tents for the sleeping quarters. The camp was closed on 6th May 1945. 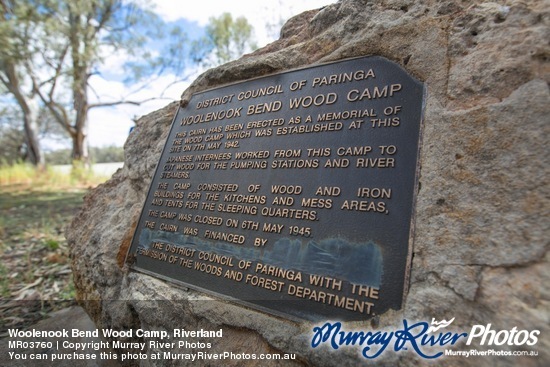 There were also camps at Katarpko and Moorook West in the Riverland. In 1988 Frank Harding (1935-1990) began his work on a series of aircraft paintings, compiled as a dedication to all the young Australian men that served in the RAAF during World War 2. (Visit 3 Squadron page). In 1989 he won the Royal Australian Airforce Heritage Award, with a painting titled "Creswells Kill". 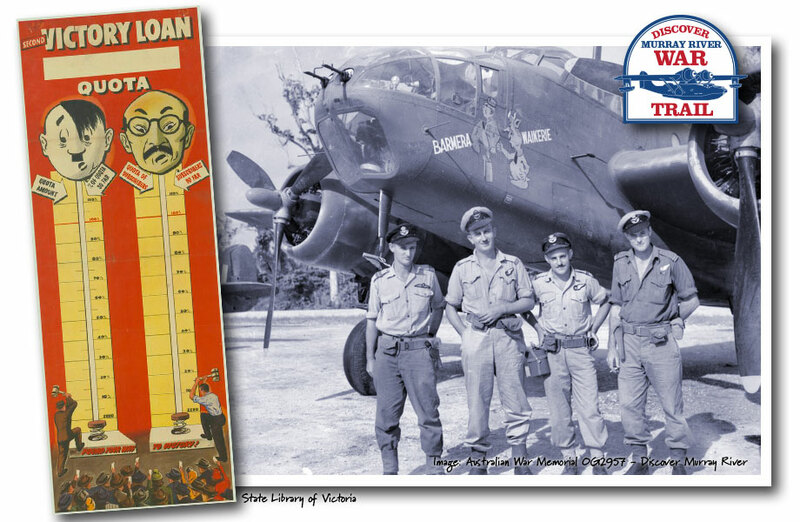 War loan programs were set up by the Commonwealth and State governments to encourage Australians to support the war effort by purchasing government war bonds which would be repaid with interest. Posters promoting the programs combined patriotism with notions of responsibility to encourage Australians to financially support the war. The nose art insignia on the fuselage of this Beaufort Bomber Aircraft A9-500 of No. 15 Squadron RAAF was nicknamed Barmera Waikerie. It was named after the two towns in the Riverland, South Australia, in recognition of the fulfillment of their third Victory Loan Quota. 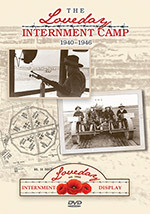 The Loveday Internment Camp was established in 1940 and closed in 1946. It was one of the largest in Australia and covered approximately 180 hectares of cultivated land. 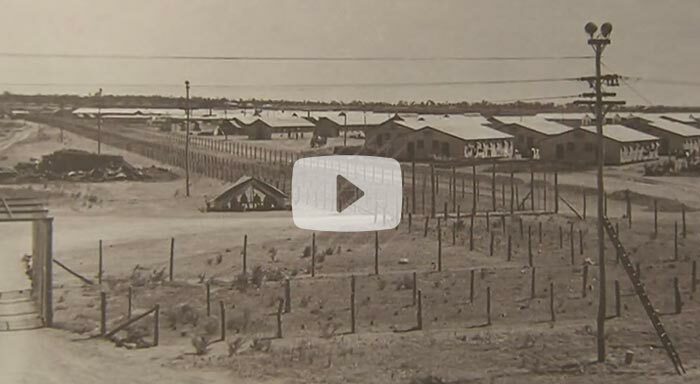 At its peak it held 5380 internees and POWs and over 1500 AMF personnel. Loveday was selected as a suitable site because it was piped for irrigation; it was near a highway linking major cities; electricity and telephone communications were available; a train service form Adelaide ran near the camp and it was sufficiently far enough inland away from the sea. Open 24 hours and free however not much remains of the originals camp. 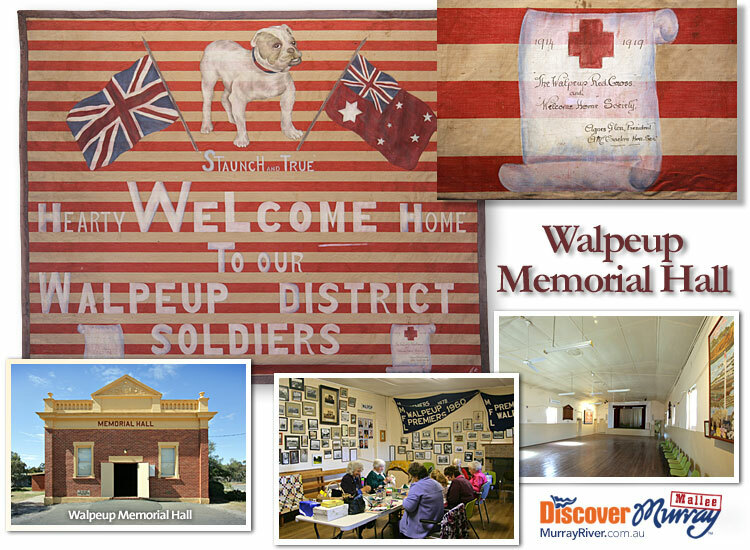 Visitors welcome to enjoy facilities and Waikerie RSL Museum Display. 10 Thompson Street, Waikerie. Open Monday to Friday 2.00pm to 6.00pm or by appointment. Phone (08) 8541 3988. 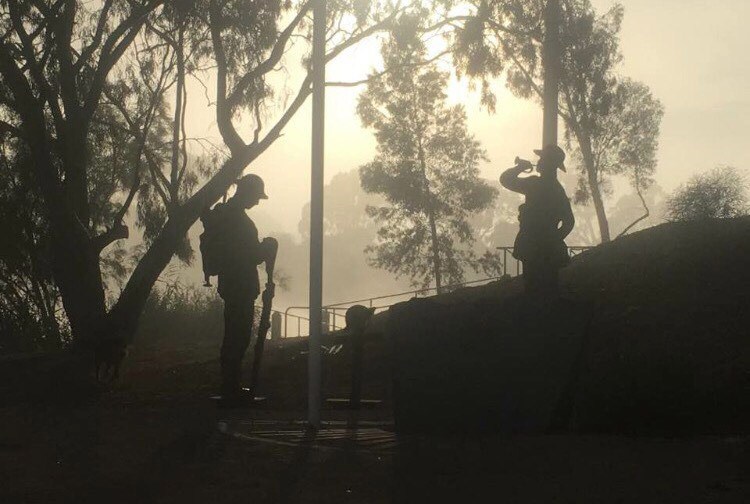 The small community of Bowhill, near Mannum, have developed a war memorial and two grand silhouettes of servicemen that were unveiled at the 2017 Anzac Day dawn service. Inscribed on the war memorial stone are the names of war veterans who were born and bred in Bowhill. A beautiful tribute to local Aboriginal men who fought in the First and Second World Wars and the Korean and Vietnam Wars. A street artist has placed a mural near Meningie's Anzac Park in honour of 18 servicemen of World War I who came from the region to serve in WWI. 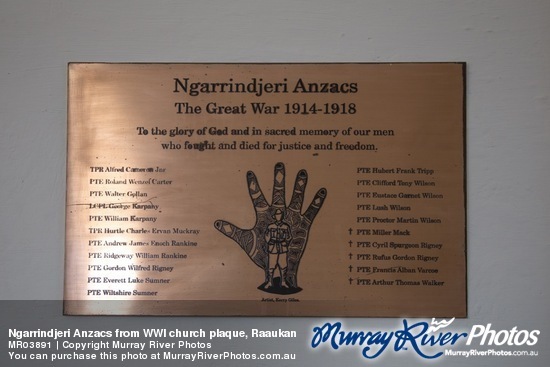 The Ngarrindjeri Nation actually had a large number of Aboriginal men serve overseas in WW1. Their ancestors have been endevouring to work with the French authorities to fly the Aboriginal flag at the Mennin Gate in northern France where a memorial to the dead soldiers is held every night. On August 6th, 1915, the 1st Australian Infantry Division launched a major offensive at Plateau 400 at Gallipoli, Turkey. The ridges had once been covered with Aleppo Pines, however, they had been cut down to line and cover trenches with only a solitary tree remaining. 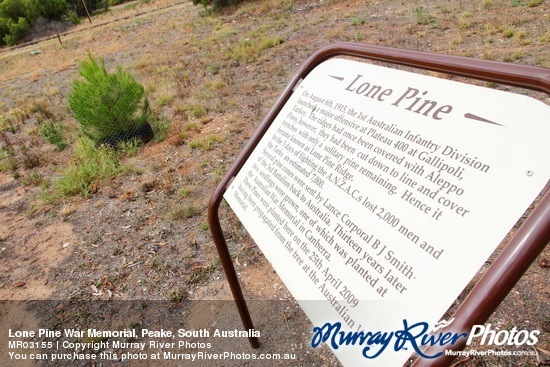 hence it became known as Lone Pine Ridge. In the three days of fighting the A.N.Z.A.C.s lost 2,000 men and the Turks an estimated 7,000. Several pine cones were sent by Lance Corporal B.J. Smith of the 3rd Battalion back to Australia. Thirteen years later two seedlings were grown, one of which was planted at the Australian War Memorial in Canberra. The Pines (at Peake) were planted here on the 25th April 2009 having been propagated from the tree at the Australian War Memorial. 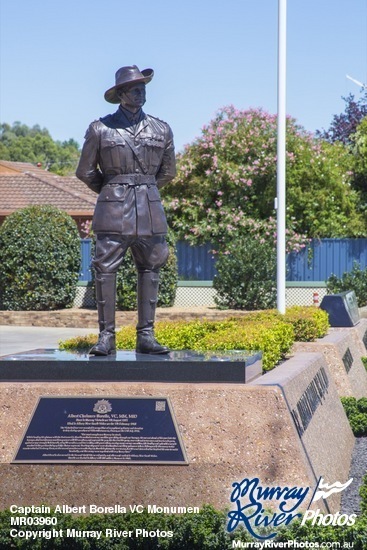 The Murray River region across New South Wales, Victoria and South Australia contains a vast range of War Memorials that honour the fallen and those that sacrificed themselves for our country. 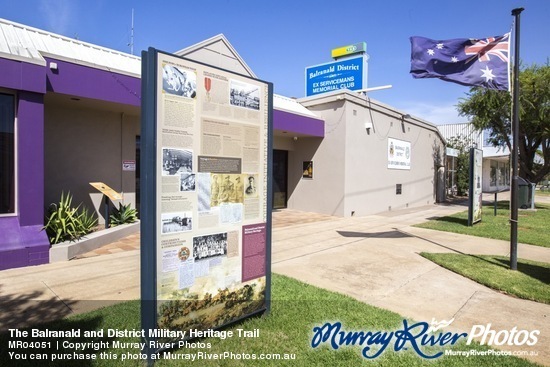 Images from the Discover Murray River War Trail.